Wyle Bleu Yonder (#1) and Send Me Good Candy (#6) dead-heat for second placed in the $827,000 Remington Park Oklahoma-Bred Futurity(RG2). 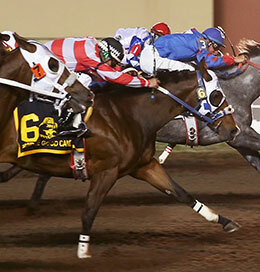 OKLAHOMA CITY, OK�APRIL 18, 2015�Royal Vista Stallion's GOOD REASON SA and IVORY JAMES sired dead-heat placers in the richest Remington Park Oklahoma-Bred Futurity(RG2) in history Saturday night at Remington Park. Send Me Good Candy and Wyld Blue Yonder spit $231,560 of the $827,000 purse for their second place dead heat efforts. Each of the two-year-olds pocketed $115,780. Send Me Good Candy races for her breeder the Estate of Carl Pevehouse. Clint Crawford trains the daughter of first crop sire Good Reason SA from the Pyc Paint Your Wagon mare Roll On Candy Wagon. Ivan Carnero had the riding call. A $43,000 Heritage Place September Yearling Sale graduate, Wyld Bleu Yonder races for owner Nicolas Johnson. Michael Taylor conditions the IVORY JAMES filly out of the stakes winning and stakes producing Royal Quick Dash mare Quick Moon Sign. Bobby D. Cox is the breeder.